When you see someone smoking the first impulse may be to shoot out a warning like “you shouldn’t smoke it will kill you” or simply the notice imprinted on packets, like this one, “ SURGEON GENERAL'S WARNING. Smoking Causes Lung Cancer, Heart Disease, Emphysema And May Complicate Pregnancy. "You might even offer the example of a person you have known, a heavy smoker who died of lung cancer. Though the intentions of such jeremiads, which often result from fear of loss, are obviously good, the net effect might be to drive a smoker to drink or at the very least make him or her seek a safe hiding spot where they can further indulge their habit. The smoker may reach for a cigarette simply to quell the anxiety created by the urgency of the warning. Smokers, drinkers and drug addicts, who have incurred a variety of problems resulting from their addictions, have all been made to witness horrible documentaries in which the scourge of the poisons of nicotine, alcohol or opiates are dramatically presented. But how many are converted by these messages. The mind is a wonderful labyrinth of defenses that all conspire to allow stagnation and even deterioration if that is the dominating drive, as it so often is in addictive personalities. The addiction itself is providing a function. So what to do when you see someone you care about bathed in a cloud of smoke, of booze, of opium? 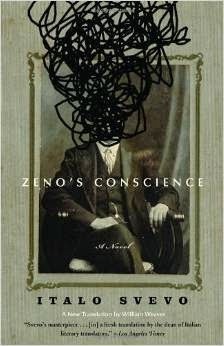 You might hand the smoker a copy of Italo Svevo’s Zeno’s Conscience: A Novel, whose protagonist turns to psychoanalysis in his attempt to cure his smoking habit and a lifetime of other problems. The book is full of humor and irony and offers no practical answers to the problem. It's also guaranteed to lower rather than raise the adrenalin of its reader which, on a short term basis, might at least create one degree of separation between the urge and the compulsive need to satisfy it. If the problem is bad enough that the smoker is suffering from emphysema or the drinker from pancreatitis, it may be time for a so-called intervention. Or it might be time simply to step back and offer your prayers and thoughts. They’ll get you drunk before you get them sober is a popular AA expression. And if that smoker’s implacable urge to go up in smoke is going to drive you to drink then the best and only thing you can do is to practice that form of love which seeks no reward.